Stryker console/camera control unit PN 988-010-000. 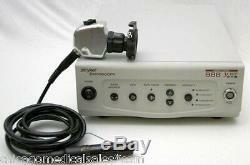 Stryker camera head PN 988-210-122. Stryker coupler PN 988-020-122 (no other accessories included, only the items pictured). CHICAGO MEDICAL SALES 3525 W. The sale of this item may be subject to regulation by the U. Food and Drug Administration and state and local regulatory agencies. The item "STRYKER 988 ENDOSCOPE SYSTEM CAMERA & CONTROLLER (CONSOLE), 30 DAYS WARRANTY" is in sale since Wednesday, August 16, 2017. This item is in the category "Business & Industrial\Healthcare, Lab & Dental\Handpieces & Instruments\Endoscope Systems & Camera Control Units". The seller is "chicagomedicalsales*com" and is located in Chicago, Illinois. This item can be shipped worldwide.